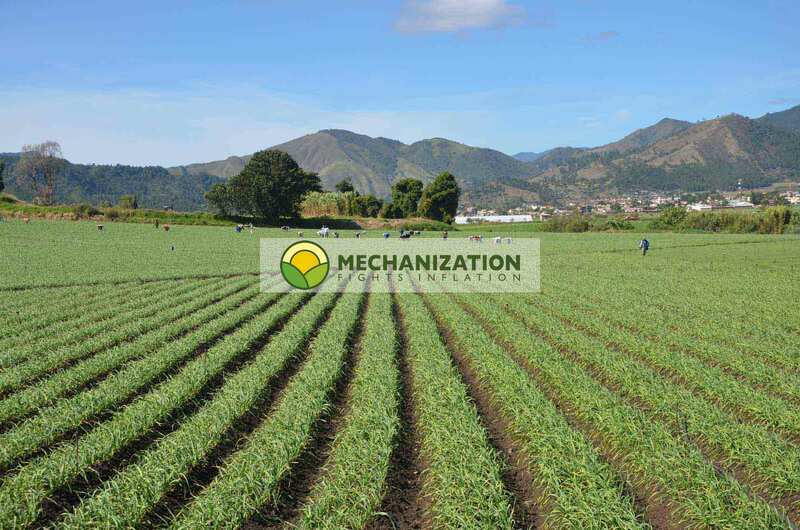 Onions potatoes: mechanization in agriculture lowers production costs. New : Agriculture in Hokkaido Japan, a very different way of doing things. We cover every process, from the moment you contemplate harvesting, to the moment you sell your produce. We focus on making these processes as efficient and cost-effective as possible, adding value to your crop every step of the way, and allowing you to sell your produce when prices are high. For example: The right moment to harvest onions and potatoes, the importance of choosing the right moment, manual or mechanised harvest, and how both of these are carried out. How and when to decide to mechanise your harvest and harvesting equipment, what the real objectives of a successful harvest are, and the cost of the harvesting process per kilogram of produce. For example: How to transport your harvest from the field after a manual or mechanised harvest. The importance of being able to move your crop to safety as quickly as possible. If you decide to store, the way you transport your crop will depend on the storage system you have or are planning to implement. How to avoid bruising your crop during transportation from the field, and how to recognise the different kinds of damage. For example: How a storage facility for onions or potatoes functions. The different systems that exist, and determining which one is right for your specific circumstances. The importance of drying your onions rapidly, and which system is best for your area. The latest on crop drying. How and when to store onions. How and when to store potatoes. The financial risk of crop shrinkage caused by storing inadequately, or not storing at all. For example: How to receive the produce at your facilities. All of the standard handling equipment, such as: reception hoppers, inspection tables, the most common grading systems, onion toppers, potato brushers and washers, palletisers, box tippers, box fillers, big bag fillers. A variety of different handling lines for potatoes, onions, carrots and more, and how we install and commission them. For example: The two main principles of weighing your crops. The precision of two fundamentally different principles. The obtainable accuracy of those systems and how to choose between them. The financial consequences of choosing the wrong system. A variety of weighing equipment for different applications. The importance and surprising consequences of packing a relatively big product in small bags (0.2 and 0.5 Kg). The wrong decision could result in you giving away up to 30% of your crop. For example: The importance of good presentation and the value that it will add to your product, doubling or even tripling your normal selling price. A large collection of bagging equipment and packing lines used in the industry all over the world today. Once again, the consequences of choosing the wrong system in relation to the size of your product and your packages or bags, and the relation between capacity and bag size with its financial implications. For example: Cutting, cleaning and brushing all kinds of vegetables, like potatoes, onions, carrots and lettuce. You name it, we have it. Also, the major potato products are explained, along with their production processes. We look at the production of chips (French fries), crisps (chips), potato flakes and potato starch. We are not in the processing business. Why not? Globally, this industry is in the hands of very big companies, most of whom have the specific knowledge in-house. They make enormous investments, because these processes run without stopping for months on end. It is all about "economies of scale". We can put you in touch with the best in the industry. For example: Why and how to rotate your crops. We have a free online tool to help you choose which crops to plant and when. The production costs of onions, potatoes, carrots and cauliflowers in the Netherlands. The surprising way in which the Dutch calculate their costs, due to their legally implemented crop rotation system. A description of how to avoid the most problematic pests and diseases which affect growers around the world. Should you decide to mechanise your production, you ought to have a look at our investment analysis tools. Its results might just surprise you, and will save you hours of sweating over spreadsheets and calculators. For example: Who we are and what we do, and most importantly, how to get in contact with us. If you are serious about discussing a project with us, please send us as much contact information as possible. The more straightforward the initial contact, the better. We have a lot of experience using Skype. All of our projects are developed during the first stage through Skype. Visit: Skype, install it on your computer or mobile phone, and then we can talk and share information as much as we want to. In order to obtain maximum value from your potato crop, onion crop, or any crop for that matter, your produce has to be: harvested, transported, stored, handled, processed and packaged at minimum costs, in the most efficient and produce-friendly way, adding value along every step of the way. Mechanisation fights inflation, and crop rotation reduces costs. What makes these two tools the best way of combatting the ever-increasing production costs of agriculture? Over time, annual human wages will only rise, whereas well-negotiated interest rates for financing mechanisation will not. This will prevent the soil being depleted of nutrients, and help to keep bacteria and fungi at bay. The newly enriched land will reduce the need for fertilisers, bactericides, fungicides and pesticides. Before the 1700s, the problem of soil fertility was met by letting half or a third of the land go fallow for a year in two-and three-field rotations. A new four-field rotation was based on growing specific kinds of crops in a sequence that took from or added different nutrients to the soil. Part of the field did not have to be left fallow, and the continuous use of the land greatly increased the production of forage crops used to support livestock through the winter, thereby vastly increasing the availability of meat and dairy products. The diet of even the poorest improved as they could now afford to augment their daily bread with meat and cheese. The author of this website offers the information herein as a free service to a specialist readership. The author reserves the intellectual property of the entire website, however, this may be quoted or referenced in compliance with the correct and normal practices on the Internet. Although the author has compiled data from various reliable sources, and the entire website has been revised by other experts, he alone accepts intellectual responsibility for these pages. The author would appreciate the indication of any errors or mistakes found within, but assumes no responsibility for any losses or damages, direct or indirect, which may arise there from.